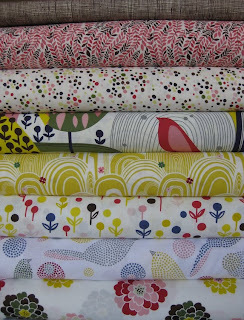 We are excited to announce our first winner of the wonderful Alexander Henry Griffith Park Fat Quarter Bundle! We will be contacting you shortly to get your address to ship your prize to! Woo hoo, thanks! What great fabric! I keep coming back here to look at the fabric and I'm super-excited because I've been wanting to work with mustard yellow for a while and haven't yet, and these fabrics have that pretty yellow in them! Woo hoo! I'm trying to find a place to buy the Sugar and Spice in Blue fabric but am not having any luck. Can I buy it from FabricWorm? Also, what do I need to do to enter your drawings?